Leading Republicans in the US have called for an investigation into leaks that led to the resignation of national security adviser Michael Flynn. The heads of the House Oversight and Judiciary Committees are concerned potentially classified information was released. Mr Flynn is alleged to have discussed US sanctions with Russia’s ambassador in calls before his own appointment. It is illegal for private citizens to conduct US diplomacy. President Donald Trump, who is also facing questions over his ties with Russia, pledged to punish the intelligence officials who leaked information. “We’re going to find the leakers and they’re going to pay a big price,” he told reporters during a meeting with Republican lawmakers on Thursday. Hours earlier, Mr Trump tweeted that “the spotlight has finally been put on the low-life leakers” who “will be caught”. Mr Flynn, a retired army lieutenant-general, initially denied having discussed sanctions with Ambassador Sergei Kislyak, and Vice-President Mike Pence publicly denied the allegations on his behalf. But he came under mounting pressure on Monday when details of his phone calls emerged in US media, as well as reports the justice department had warned the White House about him misleading senior officials and being vulnerable to Russian blackmail. In a letter to the Department of Justice inspector general, chairmen of the House committees on oversight and the judiciary said information about the monitoring of Mr Flynn’s communications by intelligence agencies was likely to have been top secret. “We have serious concerns about the potential inadequate protection of classified information here,” Reps Jason Chaffetz and Bob Goodlatte wrote. They said the release of classified information could have “grave effects on national security”. Their letter comes after other members of their party, including the Senate’s second-ranking Republican, John Cornyn, called instead for an investigation into Mr Flynn’s ties with Russia. But US House Intelligence Committee Chairman Devin Nunes told reporters on Tuesday he wanted to focus on the leaks, and said the FBI should explain why Mr Flynn’s conversation had been recorded. Both the Senate and House intelligence committees – along with the FBI – are already examining Russian hacking and involvement in the US election. It is unclear how the allegations against Mr Flynn would be handled by the different investigators. His conversations with the Russian ambassador took place about the time that then-President Barack Obama was imposing sanctions on Russia following reports it attempted to sway the US election in Mr Trump’s favour. As relations between the new US president and the country’s intelligence agencies continue to sour, the New York Times reported on Wednesday that Mr Trump was planning to appoint his friend Stephen Feinberg, the billionaire co-founder of Cerberus Capital Management, to lead a review of into their practices. The BBC has not been able to verify these claims. Meanwhile, the Kremlin has said that political turbulence in the United States is delaying the resumption of better relations between Washington and Moscow. “We hope that sooner or later the process will start to resume a normal business relationship with Washington,” Kremlin spokesman Dmitry Peskov told reporters on Thursday. 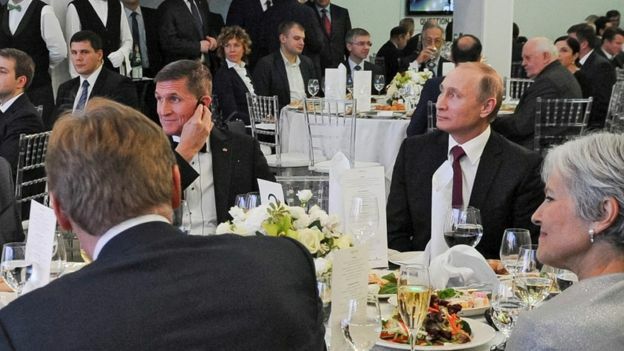 He said possible plans for an investigation into Mr Flynn was an “internal affair” for the US. Russia has dismissed concern about the former national security adviser’s communications, saying “it’s nothing to do with us”.